The long-awaited book by Chris Heintz, Flying On Your Own Wings, is, as the subtitle states: A Complete Guide to Understanding Light Airplane Design. 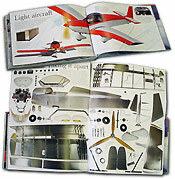 Aeronautical engineer Chris Heintz shares his knowledge and insights into the art and science of light aircraft design in this 300-page large format book, and �walks� readers through the essential understanding and skills required to conceive, develop, build and even test-fly their own personal light airplane. Basic mathematics, essential aerodynamics and stress analysis are just a few of the chapters of this fascinating book. Heintz even provides a sample design to help would-be designers take their first step towards imagining and creating their own wings. Truly a beginner�s guide to everything you need to know in order to achieve that age-old dream: To fly on your own wings! Recommended by designer Chris Heintz, the Standard Aircraft Handbook is a "must-have" for the builder/owner of an all-metal aircraft. The Federal Aviation Administration's new sport flying license will let people earn their wings for a fraction of the time and cost of a traditional license. The Complete Idiot’s Guide‚ to Sport Flying introduces this new field of flying to consumers, and shows you how to fly smart—offering tips on how to get more flying fun for less money. Includes foldout of the Zodiac kit airplane!